Leading Danish marine and fire safety equipment and servicing provider VIKING Life-Saving Equipment has signed a multi-year global servicing agreement with NK Group, a major Korean supplier of firefighting systems and related equipment, laying the foundations for a strong business alliance between the two companies. According to the agreement, VIKING will become NK's preferred service provider, carrying out marine fire servicing and sourcing original spare parts for the Korean company's customers around the world. VIKING's technicians have been specially trained in NK Group's systems, in accordance with the IMO's MSC.1/Circ.1432 revised guidelines, and have gained access to support and technical data directly from the new alliance partner. NK Group's firefighting equipment has been installed on over 10,000 vessels to date, most of which have been built in regions where VIKING already has significant market shares. With such a large installed base, the Korean company has extensive insight into shipowner needs and preferences both now and for the future. 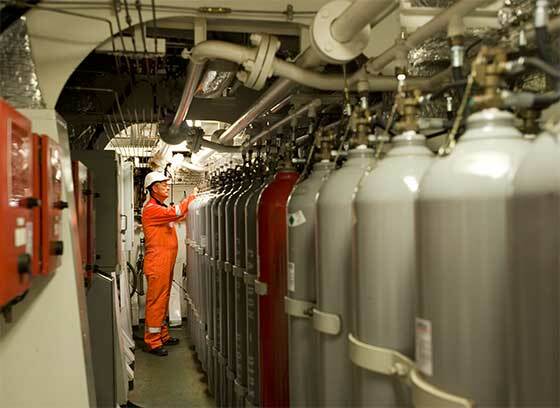 Where appropriate, data on these installations is expected to be loaded directly into VIKING's advanced service notification system, helping to streamline servicing tasks for NK Group's customers. "For example, shipowners around the world with NK products will be able to get better access to the right spare parts at the right time, helping them to uphold regulatory compliance and reduce costly delays. Key to us in choosing VIKING as a service partner was its well-qualified global service network, experience with handling shipowner contracts, and a solid track record in servicing firefighting equipment." "NK Group's products are known for their quality and reliability," says VIKING's Vice President of Global Service, Hans-Henrik Madsen. "By combining VIKING's global service network and quality standards with NK's products, we're delivering a real win for shipowners. We're excited about the chance to bring better service to shipowners with NK equipment on board, and we expect to continue to expand on this potential in the years to come." Implementation of the new agreement is already well underway, and the first two groups of VIKING service technicians have completed training at NK Group's facility in Korea.